The evolution of Maurice Denis's painting is perhaps best summarised by the phrase that he himself chose as the subtitle for his collected critical and theoretical writings: From Symbolism and Gauguin towards a New Classical Order. The artist's contact with Italian art played a key role in this development. In the autumn of 1895 he visited Italy for the first time, travelling through Tuscany and Umbria in the company of his friend and fellow-artist Sérusier. From then on he frequently returned to Italy, enamoured of its museums and landscape. But even before visiting Italy, in his celebrated 1890 manifesto Définition du néo-traditionnisme, Denis had invoked the Italian Primitives as a way of seeing nature that was in opposition to the naturalist tradition that followed. In his text he specifically referred to Fra Angelico and to a work by Ghirlandaio, the famous Portrait of an Old Man with his Grandson (Paris, Musée du Louvre). In this portrait, the golden-haired child gazes up at the old man's face, his hand placed upon the old man's breast in a profound gesture of affection; the two figures are in front of a window, through which a serene landscape can be seen. Something of this intimate and mysterious image re-appears in Denis's painting. He had a large family and often included his own children in his paintings. In the painting shown here (The Crown of Daisies), the young girl was probably inspired by his daughter Bernadette (born 1899). The composition, in which she is the central figure-spontaneous and yet at the same time imbued with the solemnity of a symbolic ceremony-perfectly captures Denis's understanding of art as the "sanctification of the natural." The crown of flowers-specifically, of daisies-that gives the picture its title is a common motif in Denis's work, and is always used in association with figures of young maidens. There are, for example, crowns of flowers in his 1897 painting Figures with Spring Landscape, the Holy Wood and his 1899 work Maiden Spring. In his fresco The Love and the Life of a Woman, the panel entitled The Crown of Betrothal (1901) shows two girls about to place a crown of flowers on the head of a third girl who is sleeping. A new version of the same motif appears yet again in one of the panels (entitled The Crown of Flowers) of the fresco entitled The Eternal Spring, 1908, which Denis painted for the dining room of Gabriel Thomas. The crown of betrothal consecrates the maiden as betrothed, thus symbolising the rite of passage between the age of innocence and that of experience. The audacities of the Nabis period behind him, Denis's colours became softer and pearlier. The dresses of the young woman and the girl are flecked with various tones of the dominant pink. 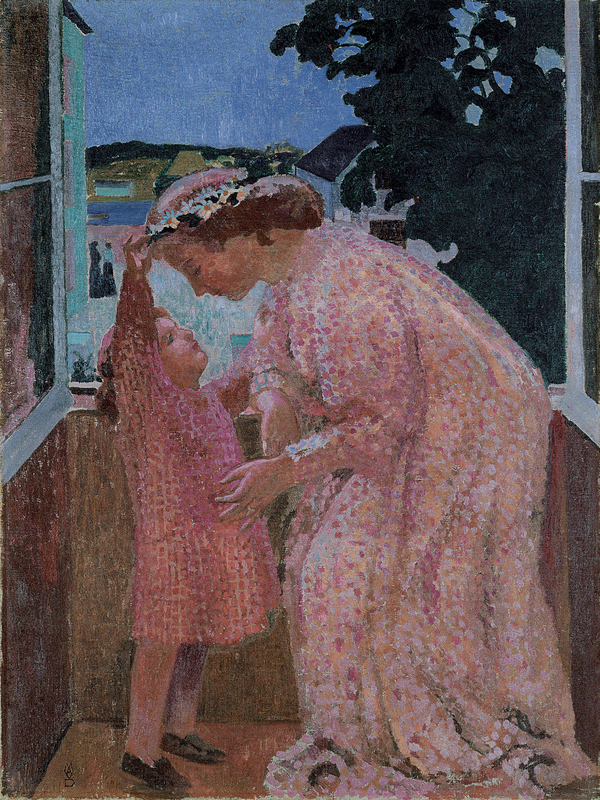 Denis had used pointillist techniques previously during the period of 1889-91, as had Vuillard (who shared a studio with Denis at that time). Beyond superficial affinities with Divisionism, however, Denis ultimately used these techniques as a decorative device intended to inject life into colour surfaces.